Figure Eight and HD Series Conductor Bar Systems for Overhead Cranes, Trolleys, Monorails, Hoists, Conveyors, and Mobile Equipment. Duct-O-Wire has the most complete line of pendant stations in the industry. 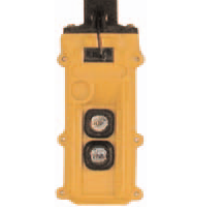 We offer a variety of pendants ranging from small and ergonomic two button enclosures to multi-function and severe environment application solutions. Standard Duty 14 and Heavy Duty 12 Gauge Galvanized Steel and Stainless Steel C-Track. Aluma-Track Systems. I-Beam Supported Trolleys. Wire Supported Systems. Round Cable and Air Hose Carriers. Class 2 Laser optics provide for crane-to-crane protection and LED sensors to safeguard against crane-to-wall collisions. The Duct-O-Wire Collision Avoidance Systems offer a simple and economical solution to inhibit crane and load damage due to operator error. Duct-O-Wire® Remote Controls advanced technology offer the user small, lightweight yet exceptional robust Trasmitters designed to reduce wear and tear, damage, and user fatigue. Receivers also adopt this technology to minimize space requirements. 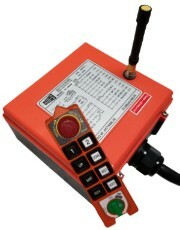 Pictured is our new RC-3M2 model, ideal for complex industrial applications. Catalogs require a PDF viewing application, which can be downloaded here. Full Catalog downloads denoted by . Installation manuals require a PDF viewing application, which can be downloaded here.